Happy April, everyone! I hope that spring is springing (or fall is falling) happily where you are. It's still snow and mud in Vermont, but soon it will be just mud, lol. March's prompt was embraced by quite a few people and there were some beautiful bezels showing up in the group. At least one person hadn't bezeled before and had a good time trying it out, which made me ridiculously happy. I hope that I will have something to show myself, soon, too. April's prompt is amulet bags. I know, I know - people either love them or hate them! But there are so many variations of this that you could go off on, and my take is a little different - to count for the prompt, it basically just needs to be a vessel that can be worn - this would include something along the lines of a locket necklace. (So if you have a locket pattern - now's the time to use it!!) There are many 'bags' that aren't bags at all - one of my favorite ever vessels is one designed for Beading By The Bay by Marcia DeCoster called Cryptex. Is this not GORGEOUS??? 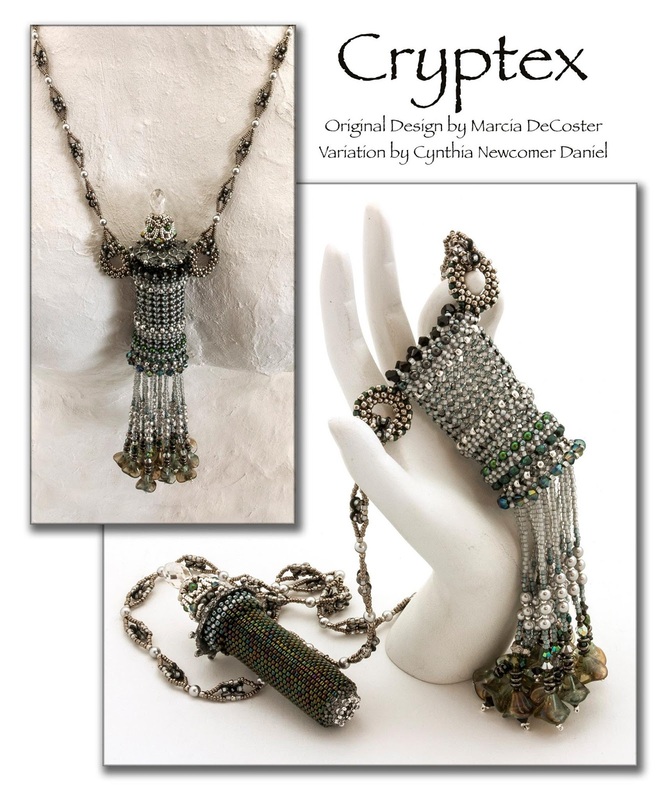 The version in this photo was beaded by Cynthia Newcomer Daniel - so elegant. And, if you leave the fringe off (which I did), you can simply use it as a vessel to display on your desk or your jewelry shelf. I had soooooooo much fun making this!! 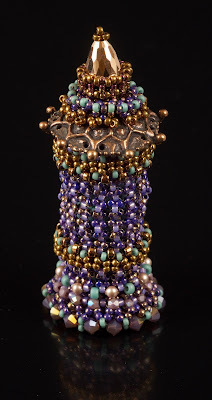 There was a round robin bead a long type thing I participated in years ago, and we made amulet bags then, too - Laura Zeiner's was AHMAZING and ROUND! And the one that was completed for me was just stunning... I have it in my office hanging right in front of my desk so that I can see it all the time. Julie Kitchen Harper made the bag, Darcy Rosner made the strap, Laura Zeiner did the embellishing and Marcia did the fringe. 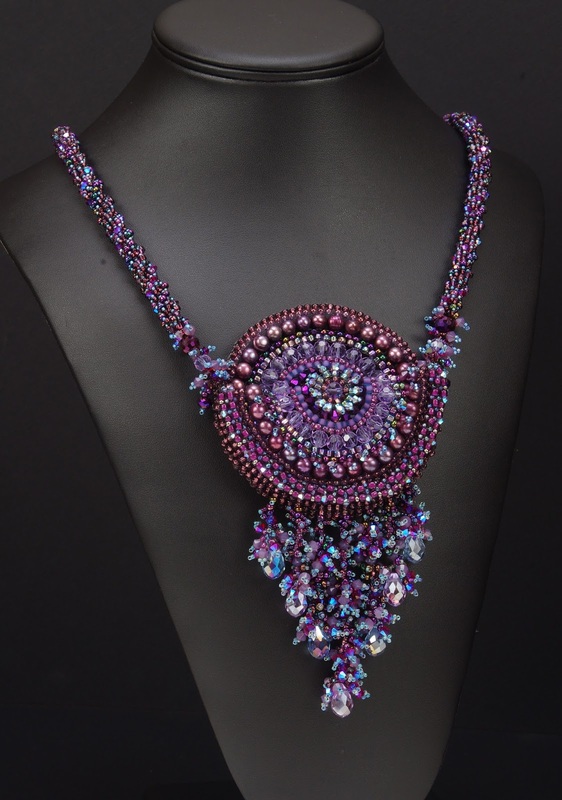 There are tons of patterns for peyote beaded amulet bags, some with incredibly detailed graphics, and some with fantastic amounts of embellishment or fringing. Some are huge and some are teeeeeeeeeny tiny. I would love to see what you could come up with in other ways, too - herringbone, RAW, hubble stitch... I have three books in my library dedicated to amulet bags/vessels for wearing, and I'll list them below if you're interested. I encourage a nice search on Etsy as well, there are several really nice peyote patterns listed that would be fun to make. You could also graph out any design you liked yourself, any size, and then bead it up and make it into a necklace. 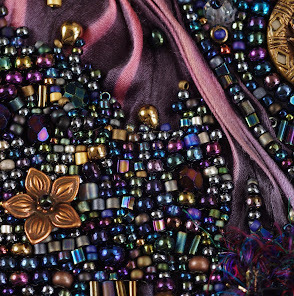 Back to Beadin' by Barbara E. Elbe is full of beautiful peyote stitched amulet bags - the diagrams/patterns are in black and white, but there is a section of full color photos to make you drool. Amazon link is HERE. Beaded Amulet Purses by Nicolette Stessin includes a faaaaaaaantastic amulet in the shape of a triangle with wings (right on the cover) that I adore. The projects inside are by various artists, collated by Nicolette - and there is a gorgeous photo gallery of inspiration in the back of the book. Amazon link is HERE. Thimble Catchers (Vol. 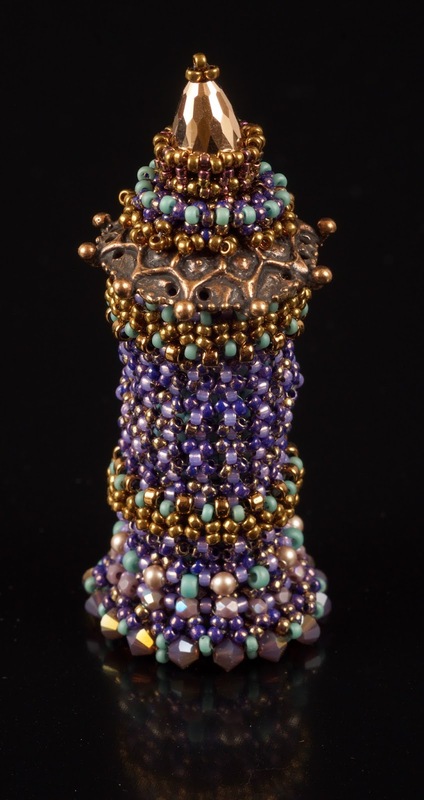 1) by Amy Lot-Kupser (i-bead.com) is adorable and fun - and these really are meant to keep thimbles in. But I think they would make great little amulet bags. You could store a tiny little stone or a message or.... Amazon link is HERE - but it's for Vol. II as they seem to have discontinued Vol I. And those are just the tip of the iceberg. If you do a little googling, you will find so many different amulets/wearable vessels that your head will spin. ;) I hope you'll try one - and if you aren't in to wearing them most of the time, engineer your strap so you can remove it and use it as a vessel (I know- extra challenge!). Happy beading until next month!! 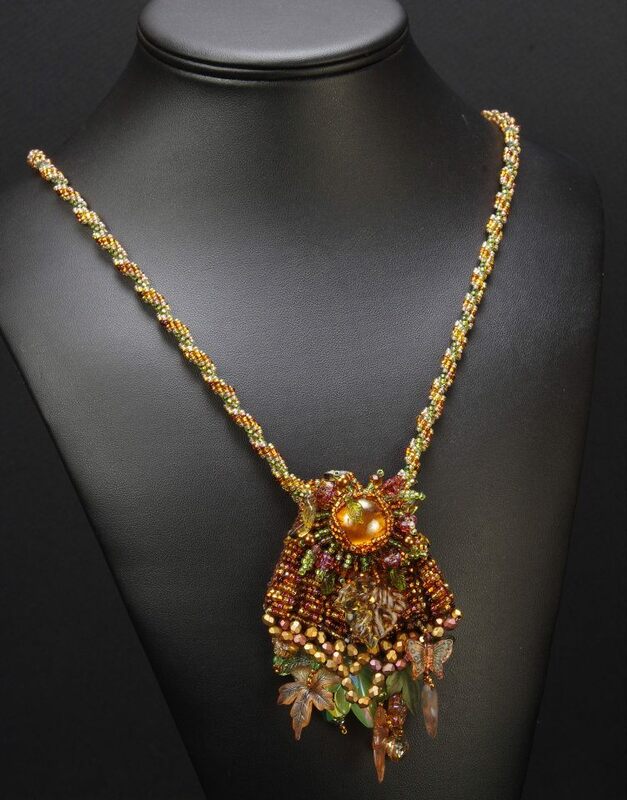 Well looks like I'll get to make something out of the beaded bags book I won from the beading gems giveaway last year. I promise I will at least start something LOL. The last few months I haven't been able to do any of the prompts but I've been following them, beautiful and so inspirational. I'm so glad you're feeling like giving it a try! :D Thank you for being part of the group! I have an idea! Just to add to your list, Julia Pretl also has a few really cool tiny vessels meant to be worn, as well. Also~is Marcia's pattern for hers available? It's stunning! !